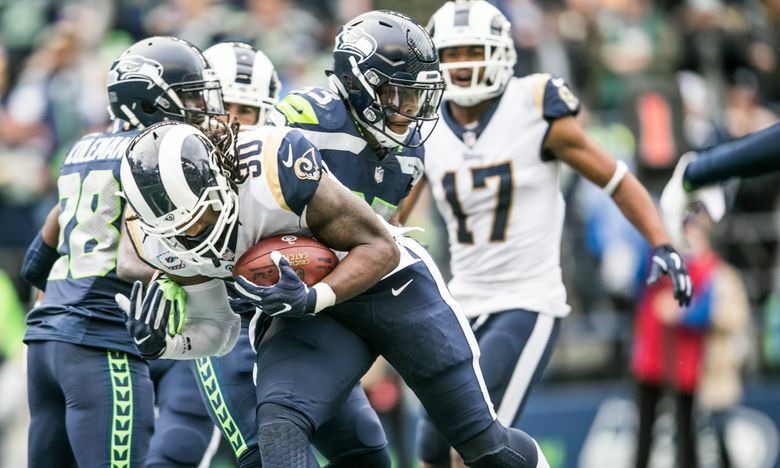 The Seahawks held their own for three quarters in a shootout with the undefeated Rams on Sunday afternoon, but the result? Rams still undefeated, Seahawks fading away in NFC West race. Show of hands: Before Sunday’s game at CenturyLink Field, did anyone think the Seahawks would go toe-to-toe with the undefeated Los Angeles Rams until the final seconds? Few expected the Seahawks to hold their own against the Rams, much less match them score-for-score through most of what was an entertaining shootout. Seattle ultimately lost 33-31, and that puts a dagger into any hopes they may have harbored of contending for the NFC West. The game also left many debating whether Pete Carroll made the right decision in calling a time out before the Rams’ fourth-and-1 play. Here’s a look at what the national media is saying about a pivotal game in the NFC West. ESPN Analytics’ Brian Burke says the Rams’ decision to go for it on fourth-and-1 was mathematically sound. “The Rams’ decision to go for it on 4th down to seal the win was the right call by a relatively large margin. They needed about 52% chance of conversion for it to be worth the risk, and league average rates in that situation are above 65%. In total, the decision to go rather than punt improved their chance of winning by 6 full percentage points. ESPN.com’s Brady Henderson says there’s a silver lining to this defeat. CBS Sports’ John Breech gives the Seahawks a solid B+ despite the end result. The New York Times’ Benjamin Hoffman hailed the Rams’ brilliance on that defining fourth-and-1 call. SI.com’s Gary Gramling lauded that “sneaky Jared Goff” in the Rams’ win. He was also impressed by Seattle’s goal line defense early in the game. And yet, somehow, Gramling points out, the Rams survived Seattle. USA Today’s Nate Davis says the Rams proved their legitimacy. NFL.com’s Kevin Patra says this game showed how much the NFC West has changed.